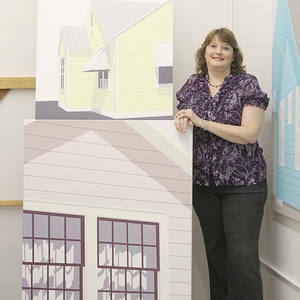 Cary Reeder, a Miami, Florida native, has made Houston, Texas her home since 1998. She worked for more than a decade as a graphic artist and typesetter in the early 80s and received her fine art training at the Glassell School of Art, Museum of Fine Arts-Houston from 2006-2013. In between her stint as a graphic artist and returning to art school, she had a 20+ year career as a grant writer and fundraiser for nonprofit organizations. Her work has been included in numerous local, regional, and national juried exhibitions, and in 2013 she had a solo show at Lawndale Art Center, a two-person exhibition at the University of Houston-Downtown, and received an Individual Artist Grant from the Houston Arts Alliance. She will be featured for the second time in New American Paintings this fall, and teaches at Art League Houston and the Glassell School of Art.